Rose Marie is one of the most-requested movies from DVD collectors around the world, one of the most popular works of screen singing team Jeanette MacDonald and Nelson Eddy. This iconic film, available exclusively from Movies Unlimited, will be available on May 1st for $19.99. 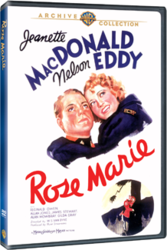 Exclusive DVD Release of Rose Marie, the 1936 Jeanette MacDonald and Nelson Eddy musicals. Rose-Marie and Maytime continue to be the most requested of all the Jeanette MacDonald and Nelson Eddy collaborations. Rose-Marie (1936) stars MacDonald as a spoiled opera star from Canada who heads to a log cabin in the northern wilderness where her brother (James Stewart) is hiding after escaping from prison. While on her journey, MacDonald meets and takes a liking to handsome Mountie (Nelson Eddy) who happens to be assigned to track down her sibling. Along with the memorable “Indian Love Call,” this classic also features such songs as “Just for You,” Some of These Days” and the title song. David Niven, Reginald Owen, Allan Jones and Gilda Gray are featured in supporting roles. As an added treat, Maytime, another MacDonald and Eddy classic from 1937, is being released through Movies Unlimited the same day as Rose Marie. Told in flashback style, Maytime (1937) showcases MacDonald as a popular European opera singer in the 1860s. She accepts a marriage proposal from her voice instructor (John Barrymore), but eventually falls for handsome crooner (Eddy). Although she sticks with Barrymore, seven years later, she discovers that the leading baritone playing opposite her in an opera is none other than her beloved Nelson. Based on an operetta by Sigmund Romberg and featuring selections composed by Wagner, Verdi, Rossini and others, Maytime was one of the best received of the MacDonald-Eddy collaborations and the actress/singer’s favorite of the eight films she made with Eddy. Rose Marie and Maytime are being released in conjunction with Warner Archives. Movies Unlimited is one of the oldest and most reliable video retailers in the world, offering DVD and Blu-ray titles, specializing in hard-to-find movie classics. Rose-Marie and Maytime can be ordered through their website at http://www.moviesunlimited.com or by calling 1-800-4-MOVIES. The Philadelphia-based company also publishes the annual encyclopedic 800-page Movies Unlimited DVD Catalog.